But, what is best for you and your home? Is it an elaborate design or a simple, sleek look? Do you want one inspired by the traditions of New Orleans or with a slightly more modern feel? It is your choice. We have it all. Beveled glass provides an appearance of luxury, style and magnificence in your entrance. The designs and varied glass give the glass more depth. The glass, in its many patterns, creates a prism effect. It is something to behold! Yes, glass can give your doorway an added appeal. But, these doors are also designed for energy efficiency. Energy efficiency is a huge deal anywhere, but in this part of the world the heat can be a real problem. These doors will help you to keep your home cool and calm even when the weather is humid and harrowing. Mahogany is an extraordinarily beautiful and durable hardwood that is only available in specific parts of the world. It is beautiful and looks amazing in homes. This is why so many furniture pieces, trims and doors are made with it. The grains and markings are fine and thin and there are few holes or other imperfections in the wood. This makes it a favorite for craftsmen, as well as homeowners and decorators. You can see what we mean about this amazing wood in person by stopping into our store in Metairie. The many designs offered by Doors of Elegance allow you to look for beveled glass doors that reflect your specific style. The artisanship, love and hard work of the craftsmen can be seen in each door and they are made with an impressive attention to detail. If you have driven around New Orleans lately, you may have noticed that beveled glass doors are everywhere. They add a sense of Southern elegance and uptown style that combines to create something really special. If you are looking for that NOLA pizazz, then look no further! 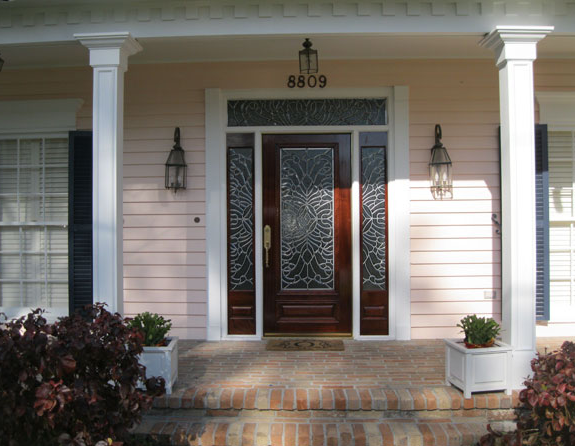 We have created our own line of NOLA inspired doors that are every bit as beautiful as they are durable and welcoming. The possibilities are practically endless. Just take a look at our wide array of amazing options. You will be delighted we guarantee it. We are here to answer any questions, walk you through the process of choosing and purchasing your door, and will not rest until you are happy with your purchase, and your home. We know that your home is your happy place and your family’s safe haven and we take seriously the responsibility of helping you create the perfect look for your entry way. Contact us today so we can get started making your dream door a reality!